Looking for the best in your budget? WMG Genie can help out! *Booked Via WMG Genie Booking Service* Vivek and his team did an amazing job of covering my wedding. They captured every single moment, making this important day memorable! For a girl like me who is not comfortable posing for cameras, the team was extremely friendly and cooperative and made me feel at ease. The cinematic video was totally worth taking! It is amazing to see how they put together all the important moments of the entire wedding in such a short video. T I would totally recommend you to hire these guys and leave the rest to them. Why should I choose Genie services? 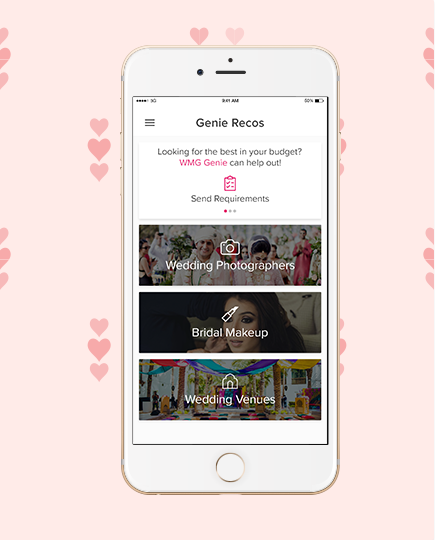 WMG Genie services can help you find the right vendor that fits your budget & style! Our Genie expert saves you the time & hassle of browsing through hundreds of profiles by suggesting only the most relevant vendors after hearing your requirements. Moreover, WedMeGood has best price guarantees for some of its vendor partners and you can avail of this through the Genie service. Service is currently free of charge for Makeup & Photography category. There is a nominal service charge levied for venues due to on ground presence. How can I get the Best price for a vendor? The WMG team has pre-negotiated Best Deals for some of our vendor partners. Once you shortlist some of your favourite vendors, you can reach to your assigned Genie expert and they can check back and tell you if the best deal is available for your chosen vendor. How do I make the payment for booking the vendor? Once you have finalised on the amount & deliverables with your chosen vendor, you can simply pay an advance to the vendor directly as per their Payment terms. Can I get recommendations for other services as well? Currently, the recommendation service is only available for Photographers, Venues & Makeup Artists. Where will I see my recommendations? Your recommendations will be visible to you on the WedMeGood app https://www.wedmegood.com/download-app/ as well as on email . We recommend you download the WedMeGood app to keep updated through the various steps.